There’s a strange disconnect at the heart of Travels with my Aunt which means it never really ignites the comic potential it possesses. 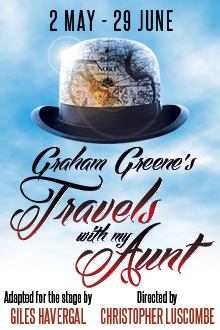 Giles Havergal’s adaptation of Graham Greene’s 1969 novel sees four actors cover a multitude of characters and a globe-trotting range of locations in a free-wheeling narrative which commences with retired bank manager Henry Pulling being reunited with his long-lost Aunt Augusta at his mother’s funeral. But the adventures that follow have a dated feel to them with a distinctly not-quite-post-colonial flavour and the presentational style also has a measured quality which only intermittently embraces the carefree spirit of the story. There’s fun to be had though, as Henry falls deeper and deeper into the rabbit hole opened by his aunt and they ricochet from the depths of suburbia to Turkey, Paraguay and more and he gradually becomes more accustomed to the new excitements of his life, which had previously been limited to growing dahlias in his back garden. The actors share the roles as well as sharing them out so Greene’s richly evocative writing is constantly changing mouthpiece as all of them take turns in playing Henry, as well as the colourful cast of characters that pop up along the journey. David Bamber just about wins on points as the most compelling version of Henry but also brings a lightness to a range of female characters and Gregory Gudgeon demonstrates huge variety and versatility covering a multitude of tiny parts, the postman being one of the wryly funniest. But in among the turns are slightly more questionable decisions. Jonathan Hyde’s Aunt Augusta is undoubtedly amusing but his style of female impersonation feels something of an anachronism in this day and age and Iain Mitchell has to tread a slightly dubious line as her Sierra Leonean manservant and lover Wordsworth. Christopher Luscombe’s revival certainly oozes quality, not least in Colin Falconer’s richly detailed set design with its railway destination board which effectively locates the fast-moving action, and the experienced cast who display their skills with panache despite initially looking like a row of blandly grey motor traders insurance salesmen. 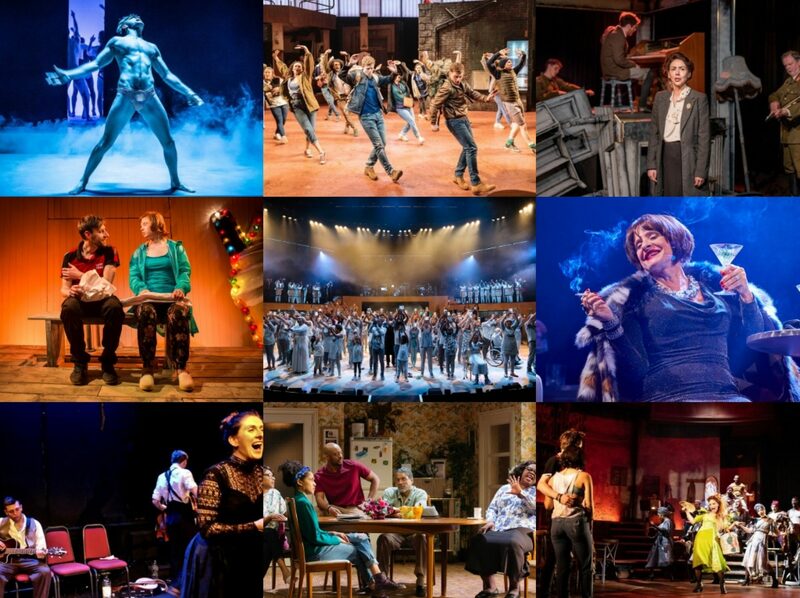 But it rarely makes an effective case for this being a play worthy of such attention. It is old-fashioned due to its very nature but the problem is it feels old-fashioned too – its antiquated attitudes, the construction that loses its comic spark at the expense of predictable twists, an overall atmosphere of dated quaintness albeit strongly performed. There was so much activity celebrating the centenary of Terence Rattigan’s birth last year that it is hardly surprising that I missed some of it, but I can’t believe I let this radio adaptation of Flare Path pass me by. Trevor Nunn’s revival at the Theatre Royal Haymarket was a genuine highlight of last year, a true revelation from this long-neglected playwright whose belated reassessment has been proved over and again by a suite of excellent productions over the last few years. And so a radio version, starring none other than my beloved Ruth Wilson alongside other such favourites like Rupert Penry-Jones, Rory Kinnear and Monica Dolan, was guaranteed to grab my attention, if only second time around. 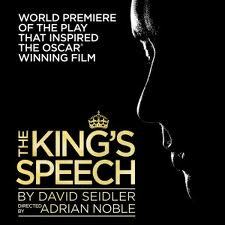 Despite winning 4 Oscars in 2011, early treatments of David Seidler’s The King’s Speech envisioned it as a play, and it was at a reading at the Pleasance theatre that film director Tom Hooper’s mother spotted its potential and the rest as they say is history. So, it never actually made it into a theatre but striking while the iron is hot, Guildford’s Yvonne Arnaud Theatre have mounted this premiere production of the show, starring Charles Edwards and Jonathan Hyde, which will undertake a short tour of the country in the coming months. 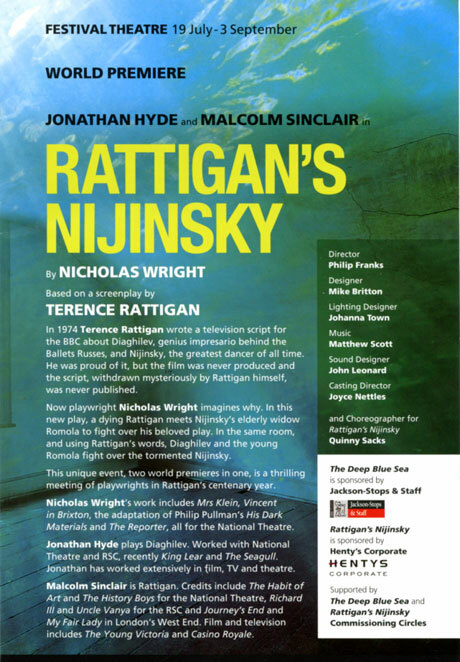 Rattigan’s Nijinsky is something of a companion piece to the production of The Deep Blue Sea with which this is playing in rep at the Chichester Festival Theatre and sharing much of its cast. Looking to make their own unique tribute in the centenary year of Rattigan’s death, new pieces have been commissioned to play alongside his plays and here, Nicholas Wright has embroidered a story around the mystery of Rattigan’s 1974 unproduced and unpublished screenplay about ballet dancer Nijinsky and his passionate affair with Ballets Russes impresario Diaghilev.